On Baseball & The Reds: How Many Runs Makes a Win? How Many Runs Makes a Win? I'm sort of gearing up to do some historical work on the Reds (I hope!). One of the questions I wanted to answer was how many runs equals a win. We did something like this in SABR 101x, but something about the algebra didn't seem right at the time, and the estimates we were finding seemed low. For each year in baseball history, find the average PythagenPat record based on average runs scored and runs allowed per team. This will, obviously, be a 0.500 record, unless there is a clerical error. For each year, find the expected PythagenPat record if you add 1 run scored to the average team. This will be, barely, a 0.500+ record. Figure the expected number of wins each year based on those two records. This will vary depending on the number of games, and, of course, the expected record. Calculate the difference between the "0.500 record" wins and the ".500 record +1 run" wins. This gives you the wins per run. Take the reciprocal of wins per run. This is runs per win. I actually added 0.1 runs instead of 1 run, just to avoid changing the run environment. It probably doesn't matter. I also tried it using +1 run allowed or -1 run scored, and it really didn't change the estimates. In addition to my run per win estimate (the blue line), I've also added straight-up total runs scored per game (i.e. runs scored + runs allowed for each game). In the past, I've advocated just using total runs scored per game as a shorthand for the runs per win estimate. You can see that it tracks pretty well (although it consistently underestimates the correct number over most of baseball history. Ok, so from this you can see that runs per win (again, focus on the blue line) tracks between 9 and 10 runs pretty consistently. But it definitely does vary with run environment. 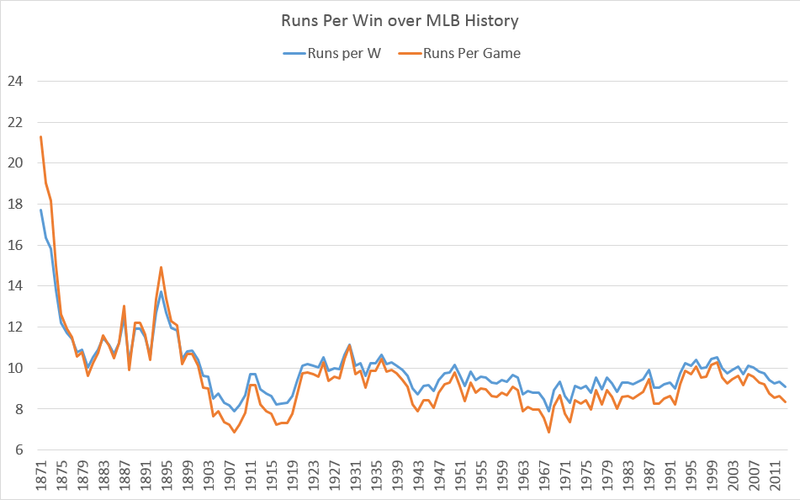 As runs per game increases (orange line), so too does the number of runs you need to score to win a game. That makes sense. When I was working on my player value series, and as the WAR frameworks at FanGraphs and Baseball Reference were being developed in the mid-2000's, you often heard people say that 10 runs = 1 win. That was pretty much true from 1993-2009. But as the run environment has plummeted over the past several years (the strikeout era? ), the runs needed per win has decreased as well. In 2013, I have it at 9.07 runs per game. 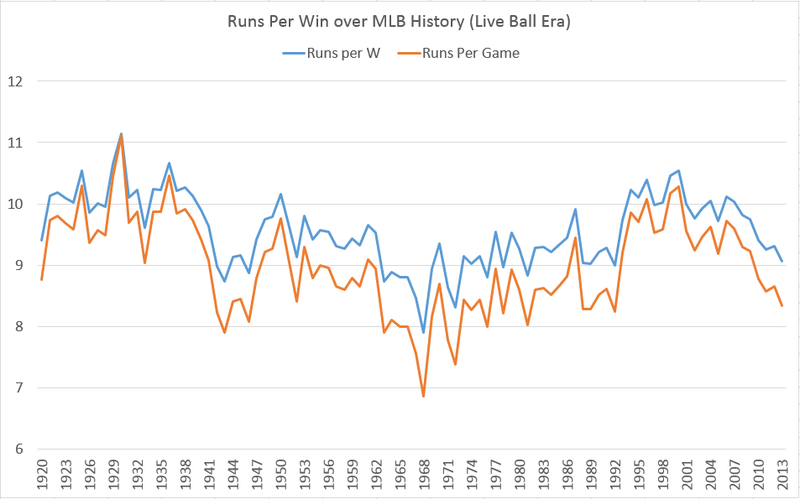 It's a small thing, but something to keep in mind as we look at different eras over baseball history. I'm sure these numbers are available elsewhere, but for those interested I'm posting a spreadsheet with these data on google docs. If you use those data for a project that is published somewhere, please link back to this post. All data pulled from the Lahman Database.